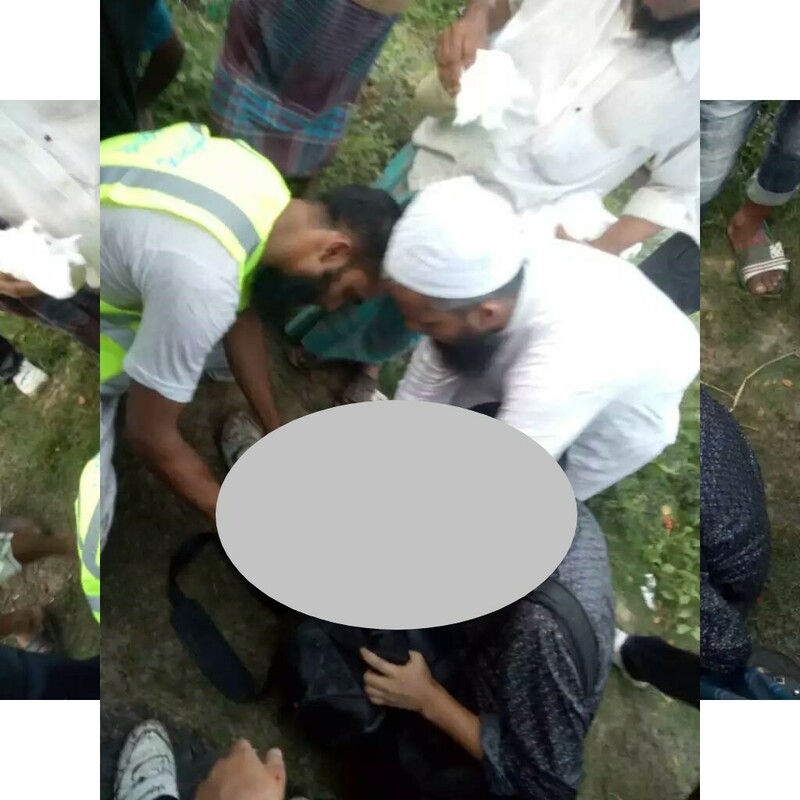 On the 24th of February 2018 in Daulatpur Zone Comilla at 5.30 pm, TraumaLink’s Volunteer Md. 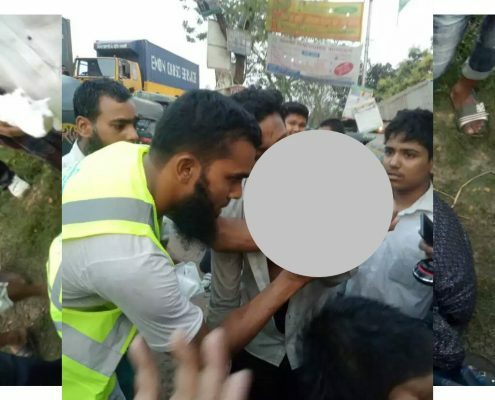 Johirul Islam, Imam of Daulatpur Jame Masjid, heard a tremendous sound of a car’s tire burst while taking prayer. 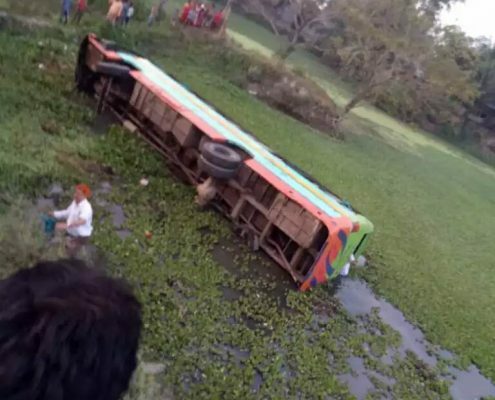 At that, he immediately ran outside and saw a bus fell into a ditch, and yes it was Motigheel Ideal High School & College Bus carrying 52 students and teachers. 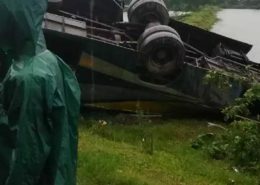 Without a thought, Mr. Johirul made a call to TraumaLink call center and just dove into the ditch and started to get the injured out. 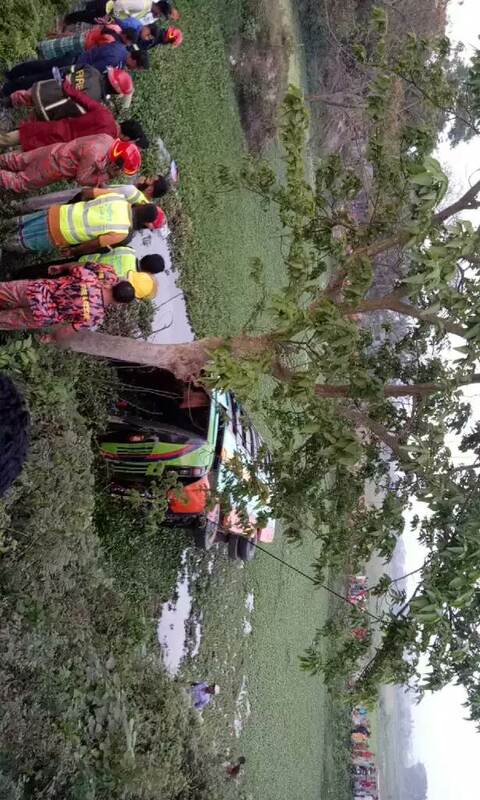 The bus carrying students were coming back to Dhaka from Picnic, while it lost control and fell into the roadside ditch. 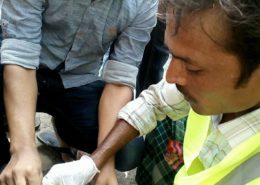 Then in few minutes TraumaLink’s volunteers Mr. Yasin Hasan Shahin, Md. Alamin, Md. Sobuj Hossain, Md. 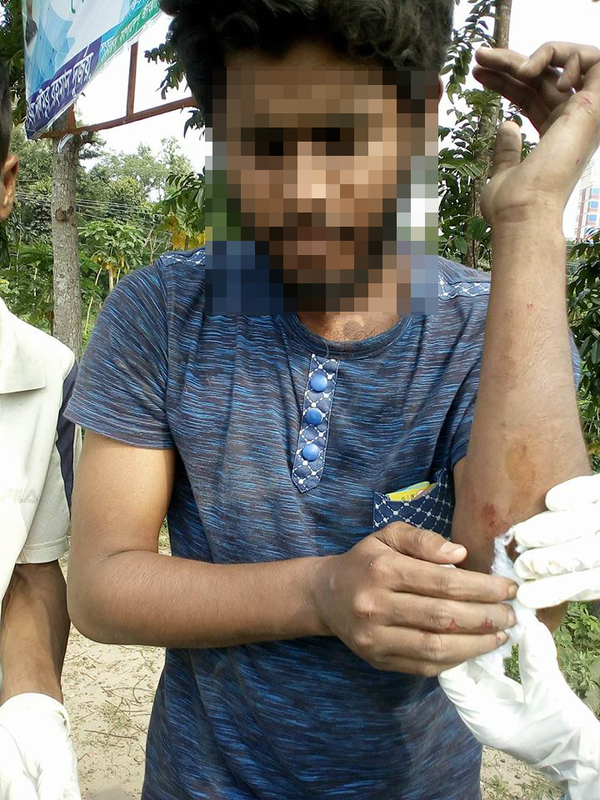 Faiz Ahmed, Mr. Noor Mohammad were dispatched at the scene. 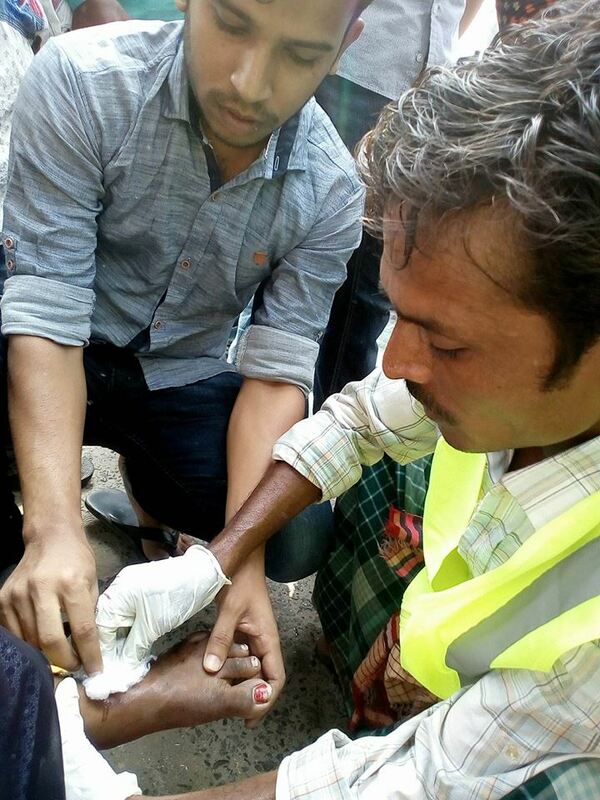 Then altogether, all volunteers provided emergency first service on 22 injured patients. At the spot, Elliotganj’s Highway Police In Charge Mr. Jibon Hajari, Daudkandi and Comilla’s Fire Brigade, Daudkandi UNO, Comilla Highway Region Circle SP, Daudkandi Thana Police were all present at the scene. 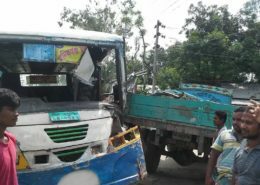 Then everyone managed and made arrangement to send everyone to Gouripur Government Hospital. We would like to thank our volunteers for their undying efforts, dedication and courage and for providing the service at the right moment. 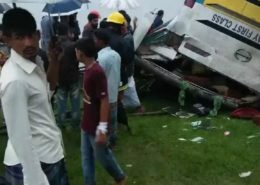 A passenger bus suffered a brake failure and fell into a road side ditch at 6 in the morning in Raipur Bazar Cumilla on 16th of July 2018. 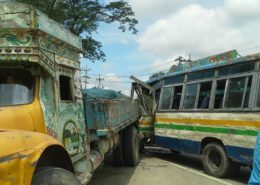 This caused injury to 10 passengers of the bus. TraumaLink’s call center dispatched volunteers Noyon Chandra Voumik, Chondon Voumik, Md. Abdul Karim. to the incident spot immediately after the incident alert was received by TraumaLink’s 24/7 call center. 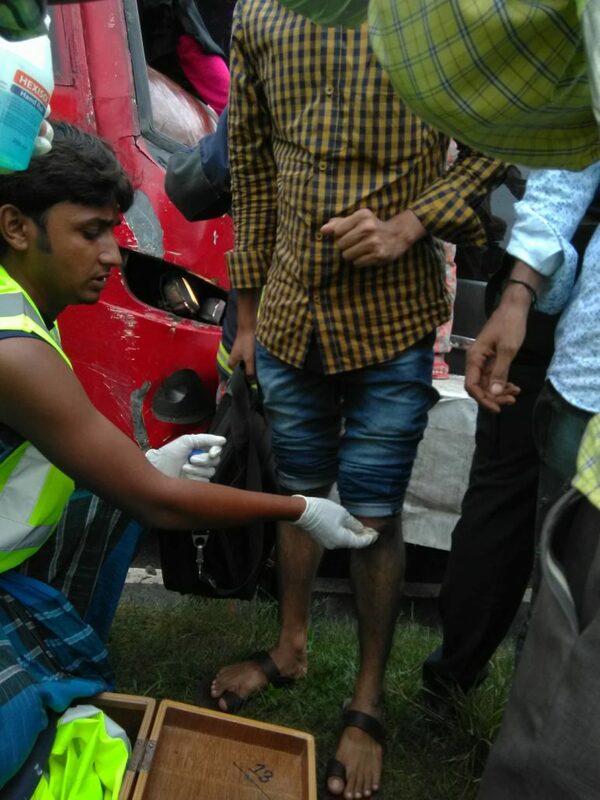 Our volunteers provided Emergency First Aid Treatment and sent the injured passengers to the hospital. 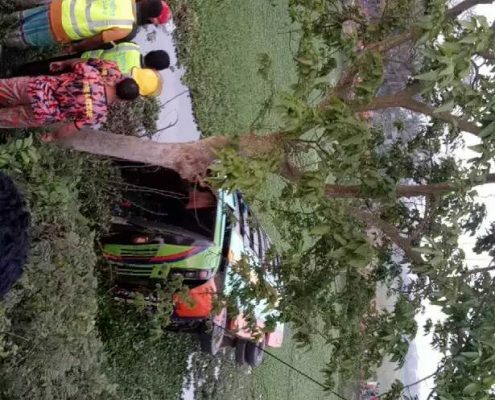 At 8.35 pm on 30th of June 2018, an incident took place at Falshatia Manikganj. 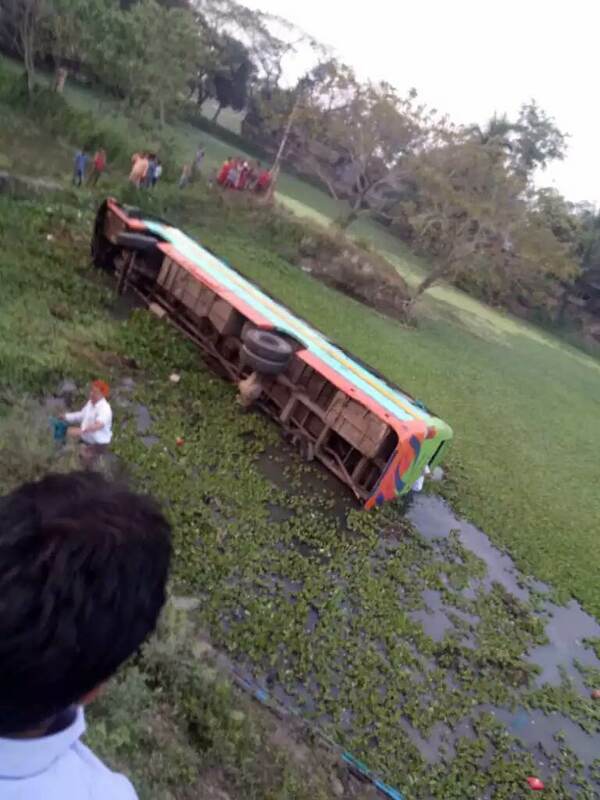 A fast moving passenger bus lost control and went over the road divider. 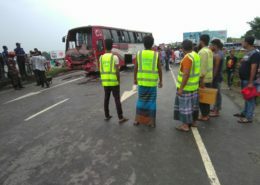 The bus immediately fell on the the road and the passengers inside the bus were injured. Our Volunteers Md. Jewel Khan, Md. 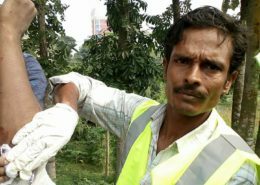 Imran, Tohidul Islam Tohid rushed to the incident spot immediately and provided Emergency First Aid Treatment to all the injured passengers. 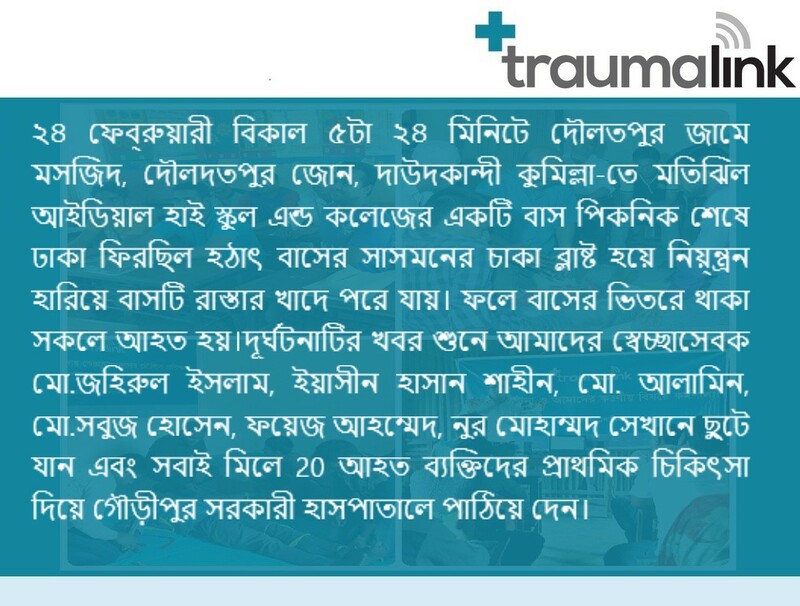 9 of the injured patients were treated and sent of home, and 1 patient was critically injured who was sent to the hospital after receiving Emergency First Aid Treatment from TraumaLink volunteers. 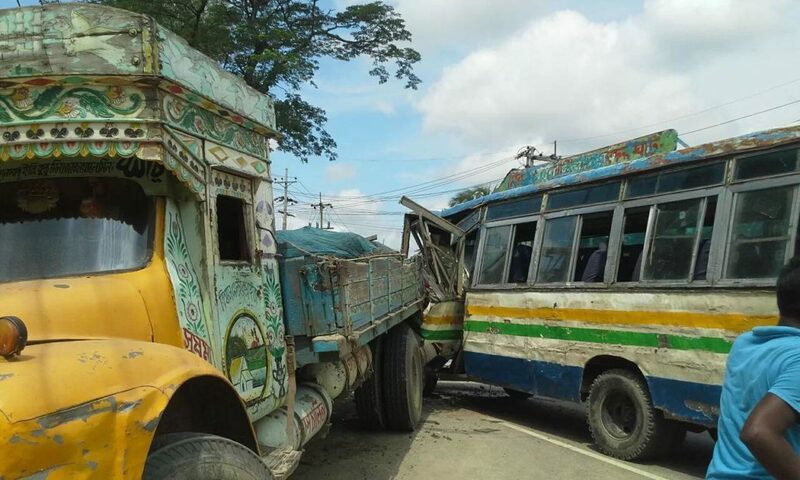 On the 19th of June 2018 two passenger buses were coming towards Dhaka and suddenly a micro bus in front of them made an u-turn and this resulted the buses to instantly put hard brake. 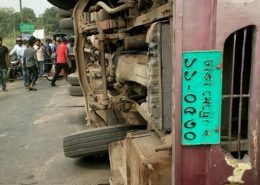 This caused a private car and micro bus to hit those bus from behind and fell on road side ditches and injured 13 people. 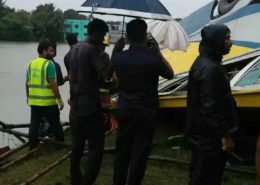 The incident alert was instantly reached to TraumaLink call center and the volunteers located nearby were dispatched immediately. Our volunteers Masud Parvej, Md. 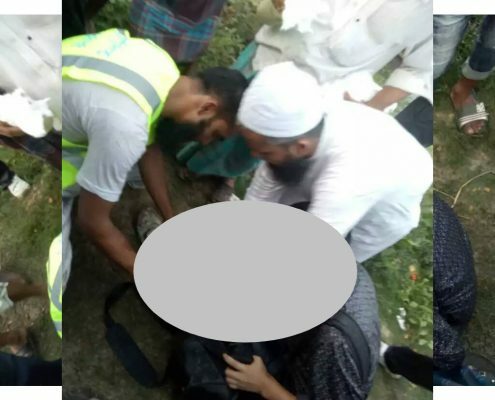 Robiullah , Mohammad Shakil , reached the spot instantly and recovered the injured persons from the wrecked vehicles and provided them Emergency First Aid Treatment and later the patients were sent to the nearby hospital. 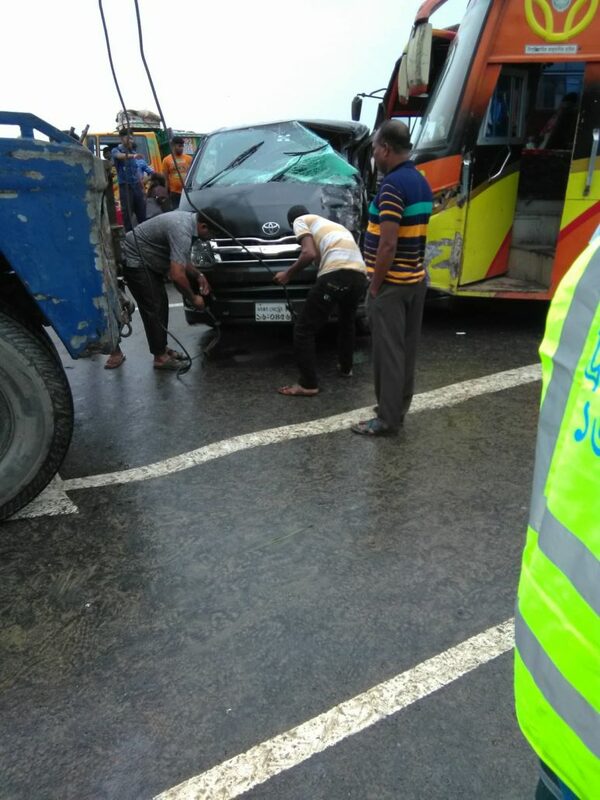 A severe incident took place on 8th of June 2018 where a truck came from wrong side and while taking a turn it collided head on with an oncoming passenger bus. 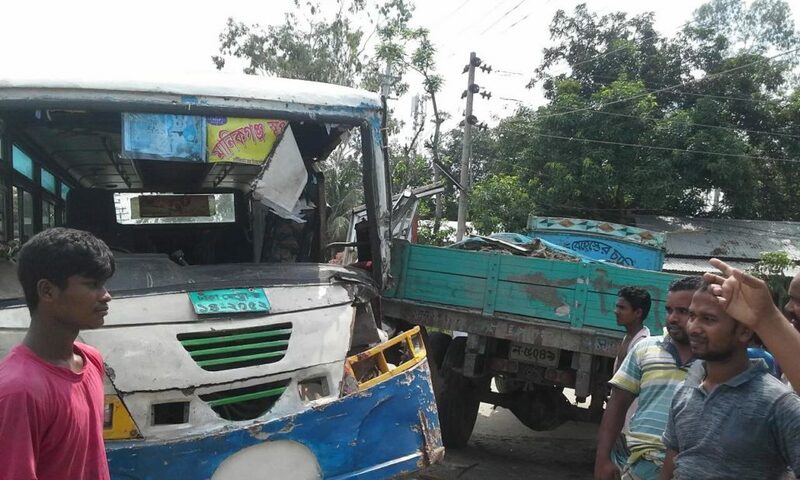 This took place in Uchutia Manikganj at 10 am and 20 people got injured. 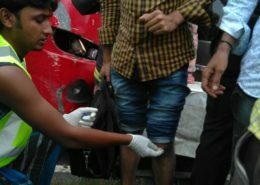 TraumaLink’s Vounteers were located nearby the incident spot, and they rushed to the spot immediately. 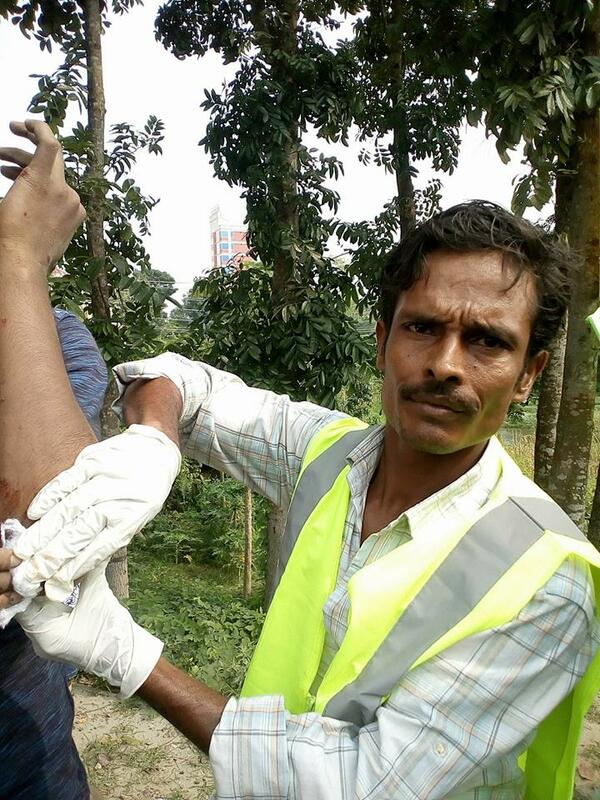 After reaching the incident spot the volunteers provided Emergency First Aid Treatment to all the injured persons. 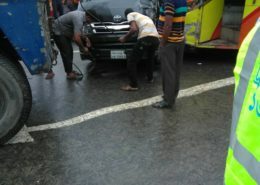 Later on the patients were sent to the hospitals by using Fire Service and Civil Defense Ambulance and other vehicles. 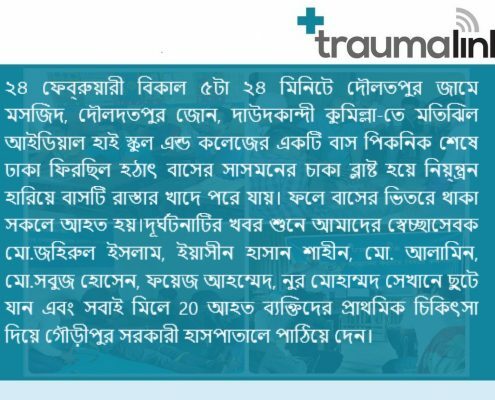 Highway Police Authority and Fire Service and Civil Defense Authority cooperated with TraumaLink’s volunteer throughout the rescue process. 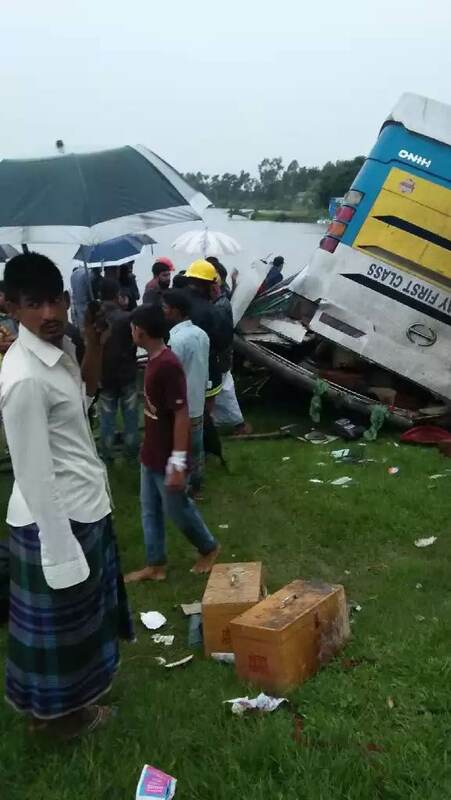 Sadly on 15th of May 2018 at Monnu City Zone Manikganj, a passenger bus carrying 20 passengers lost control of its speed and fell onto the road side while giving side to a motorbike. 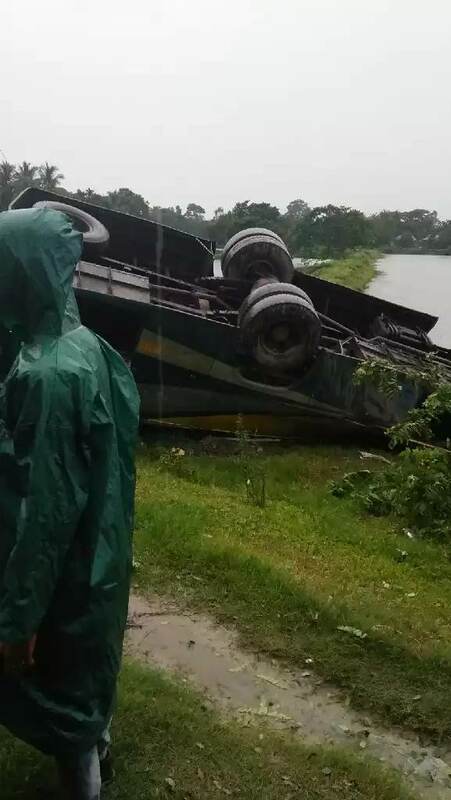 One of TraumaLink’s volunteer witnessed the incident, informed the call center and rushed to the spot. TraumaLink Call Center immediately dispatched 2 more volunteers. 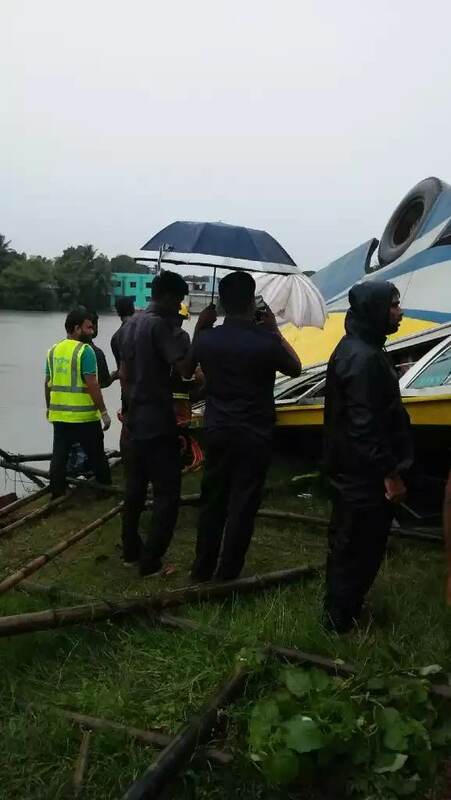 Sadly, of all the passengers were injured severely. 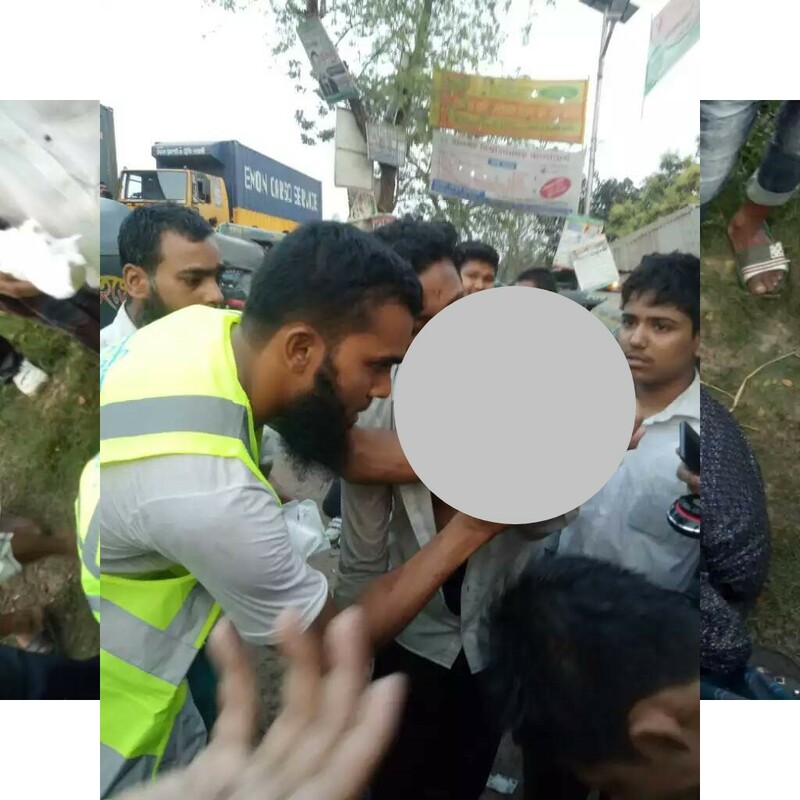 TraumaLink’s volunteers recovered the injured passengers from the wrecked bus and immediately provided Emergency First Aid treatment to the injured persons. 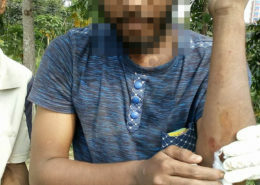 Later the patients were sent to the nearest hospital. 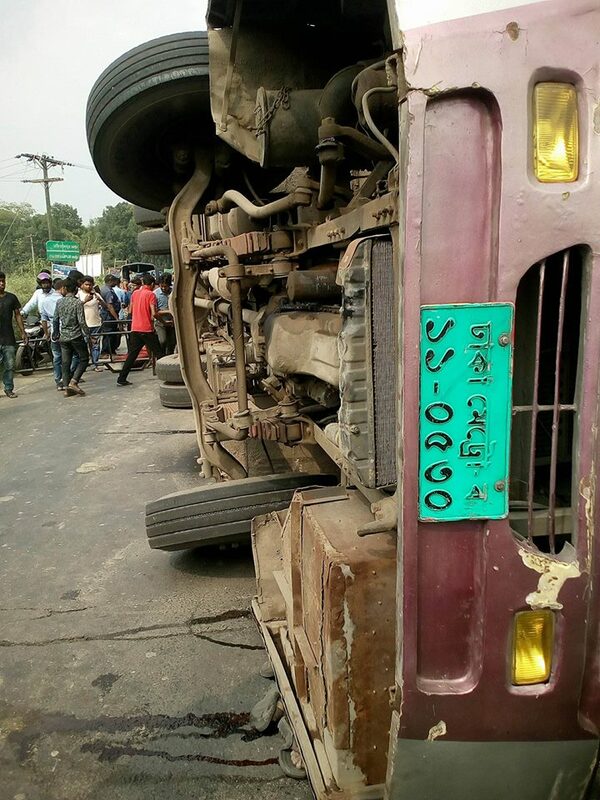 Highway Police authority and Local Fire Service and Defence authority cooperated throughout the whole rescue process. Unfortunately 3 souls were lost at the spot when the incident occurred.